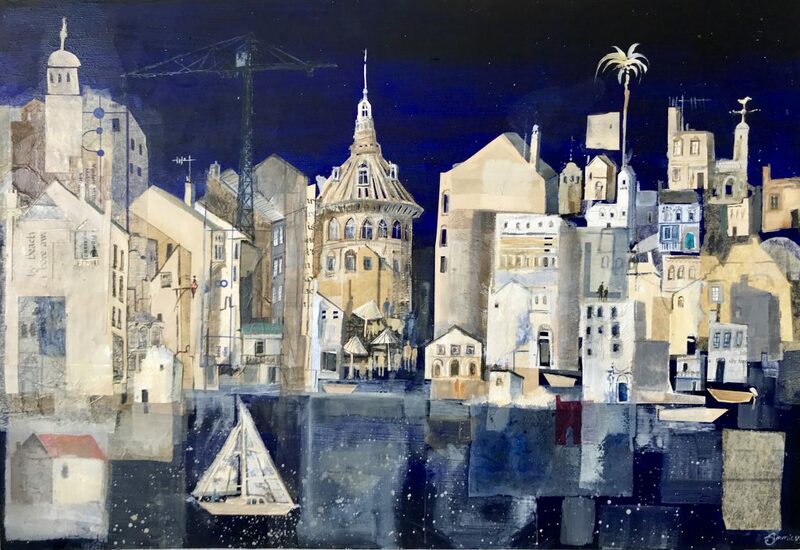 This collection of work is based on some of Europes ports and towns that we visited and which have welcomed and sheltered sailers through the centuries on their way to the discoveries of the ‘New World’. The Cathedral of Santiago de Compostela looked at its most dramatic in the evening light highlighting a labyrinth of details, grand arches, pillars and rooftop features. For some this is the end of a pilgrimage of a very long journey perhaps hundreds, if not thousands of kilometres and the feeling in the huge square outside, even without this incredible journey, is one of awe. An amalgamation of several ports and towns visited in the North coast of Spain, a rugged coastline but with opulent buildings from sailers on the return from the ‘New World’ who had made their fortunes and were keen to show it. The ghostlike reminients of buildings that have been and will be, memories fade in and out of each other. Although one clear memory had been sketching the tower centrally located, the skies behind it were darkening and we left it just a little too long before running to the dingy and racing back to the boat as large drops started to fall and and the storm obliterated the mountain infront mid crossing the large river and it came down in full force as we tried to negotiate around sand banks that had appeared. The only thing I managed to keep dry was my sketchbook with vital plans and ideas for this piece. 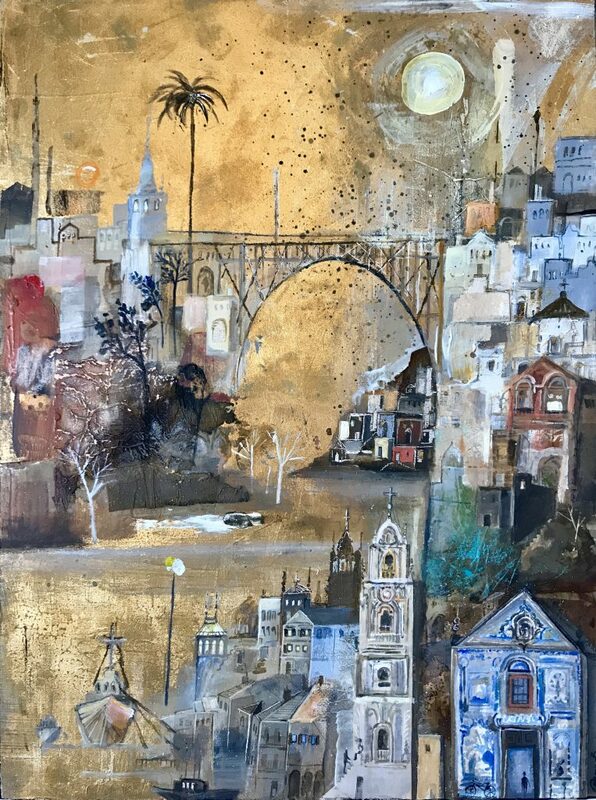 A portrayal of Porto, Portugal as seen from the bustling waterfront, the layers of buildings crossing, merging and layering like the urban contours of a map. 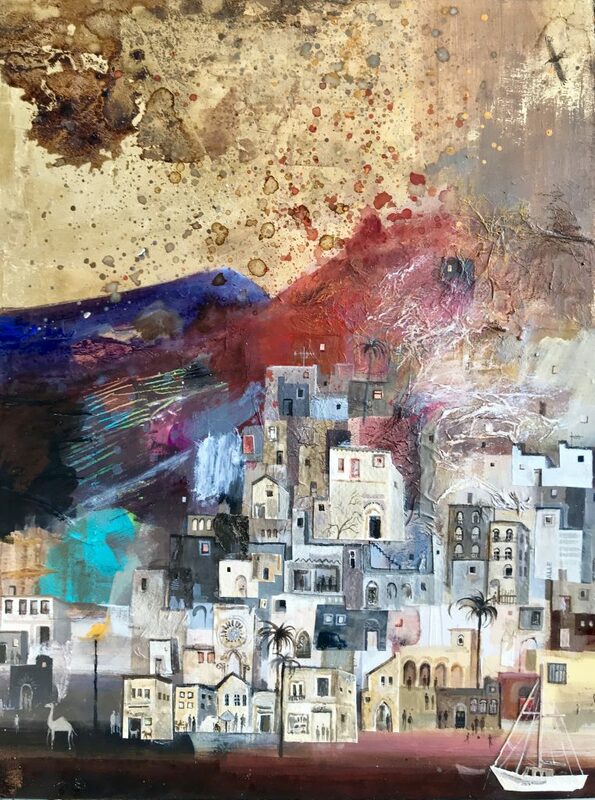 Some of the piece is representational, some fictional and others parts an amalgamation of different scenes such as the Clerigos tower rising proudly from the other buildings. This is in part a paper cut intertwined into mixed media of other papers, gold leaf highlights and acrylics on board. 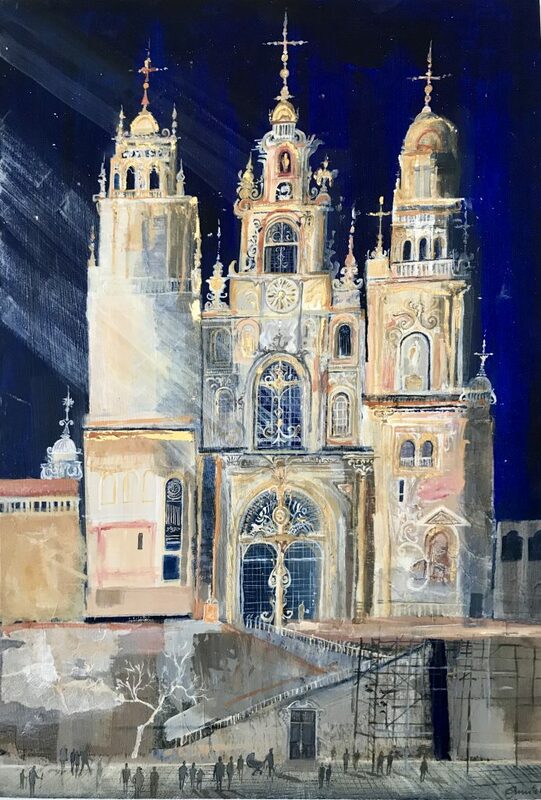 It was a fascinating experience as having studied and painted Porto a number of times before this was the first visit in person and I recognised parts of it. 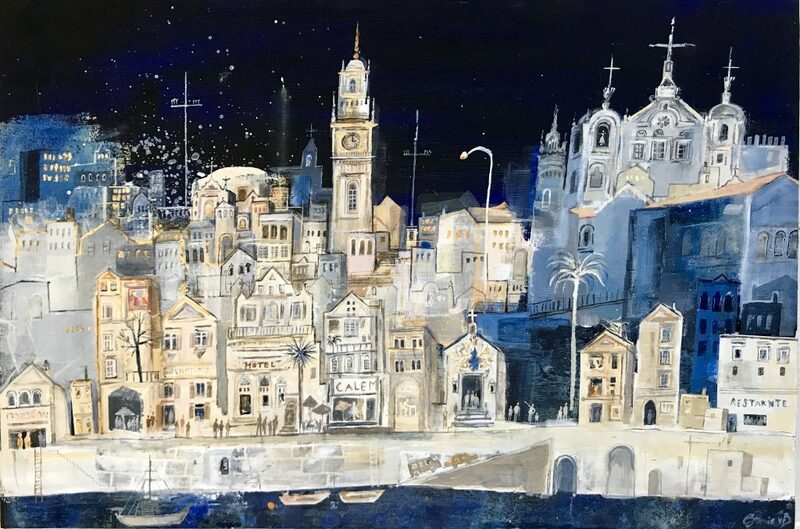 A dreamlike representation of the Portuguese town which I have been very inspired by. One of the dramatic bridges in the background is what I was stood on to get this view point, buildings of interest bought into the foreground, the elongated houses and air of old architectural elegance portrayed. Eastern Canary Islands are made up from dramatic volcanic activity of lava flows and black rock that has been catapulted from the crators. You almost get the impression they could erupt again at any moment! The colours are incredible a mixture of blacks, browns, reds and yellow ochre and add to this the white buildings stand out in contrast to the backdrop. Athough this piece had already been prepared with a mixed media background it was started in earnest during the ‘Golden hour’ before the sun sets and all the colours draw the warmth of the day to them. Families and friends frolic on the waterfront making the most of the last light before another day draws to a close, which I tried to depict in the foreground. In the background can also be seen the illusion of cultivated land and infact the high nutrient content of the volcanic soil means that crops and wine benefit from some good growing conditions despite virtually no water being available. The higher of the buildings merge into the earth as they did into the night. I’m often most creative in the evening and at night when the activity of the day draws in but for this piece it was essential to work on it with natural daylight to ensure the balance of the colours so I stopped work earlier than usual. ©2018 Emmie van Biervliet.Unauthorised reproduction strictly prohibited.